This document is an ever growing set of questions, statements, ideas and complaints about AfterStep version 2.0. The rest of this document assumes you are running AfterStep 2.0. If you are running a version of AfterStep prior to version 2.0, this document will suggests only one thing: upgrade. AfterStep is a Window Manager for the X Window System (hereafter referred to as X). It was started to emulate the look and feel of NeXTSTEP(tm), but has evolved into something that while still being able to emulate NeXT, can do much much more. Without using much memory or cpu time, AfterStep provides all the features one could want in a Window Manager. 1.3. What is AfterStep's history? Idea was to emulate some of the look and feel of the NEXTSTEP(tm) user interface, but overtime it evolved to include other concepts, as dictated by end user needs. It is that unholy direction that made Alfredo Kojima abandon project in 1997 and create a Window Manger of its own - Window Maker, which had a goal of strict adherance to NEXTSTEP interface ideas. After releasing version 1.8.11 it became aparent for developers that old AfterStep codebase had reached its limits and required a substantial redesign. Such redesign began with development of radically new image handling library libAfterImage, introducing high quality image manipulation, blending, TrueType fonts, XML image scripting, and more. Building off of libAfterImage and incorporating new developments in X Window management, AfterStep 2.0 was born and released in September, 2004. As of now AfterStep code base contains none of the original fvwm parts, and association to fvwm, twm and BowMan remain only in history. 1.4. Fine, what if I'm not running AfterStep 2.0? Is there a FAQ for me? Yes. There should be a version of the AfterStep FAQ available within your specific AfterStep distribution. If you are using a version earlier than 2.0, it is strongly suggested you upgrade. 1.5. What is X? What are these " window managers" ? "X" is shorthand for The X Window System. It is a basis for building graphical user interfaces for UNIX (it is available for non-UNIX systems, but wasn't designed to be as such). "X" is not the interface itself, just a foundation for one. For more information, check www.x.org. A Window Manager is a program that manages your windows during your X session. AfterStep is one of many available window managers. 1.6. What are AfterStep's main features? Similar to NeXTSTEP's(tm) Dock, it allows applications to be Swallowed, shortcuts with icons, and many other things. 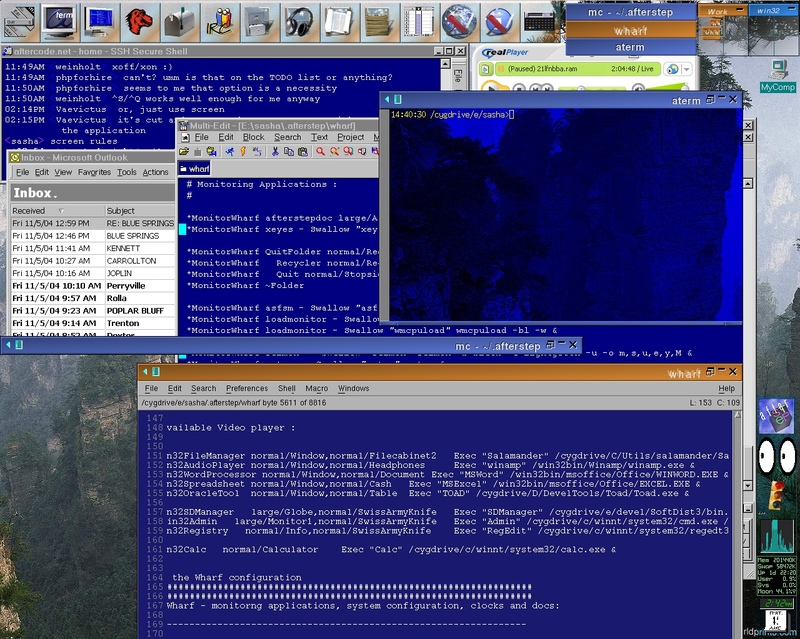 Shows a miniature view of the Afterstep desktops, you can move between them, and move windows around in the Pager as though it were a miniature desktop. A list of all the windows, clicking on the items can show that window , destroy it, shade it, or anything you might want. Almost anything can be changed. AfterStep allows XML scripts to be used to assemble complex images for things like buttons, frame sides, etc, from other, simplier images or graphical primitives. Antialised TrueType fonts could be used to render window titles and other labels. Most international character encodings are supported as long as fonts provide glyphs. AfterStep can calculate a set of about 34 colors to create looks with harmonious color composition. 1.7. Is AfterStep 2.0 GNOME and/or KDE compliant? AfterStep 2.0 supports Extended Window Manager Hints, ICCCM protocol and Motif hints, thus making it as compatible as possible with both GNOME and KDE , as well as most other X applications. 1.8. Can I run it in Microsoft Windows(tm)? AfterStep 2.0 does run under Windows using CYGWIN compatibility layer, while running any X server. Some of the X servers available under Windows allow so-called root-less mode, where X applications can coincide with native applications. See sample screenshot. coordinator, coder, web designer, carpenter, and everything else ( at the moment ). 1.10. AfterStep is awesome! How can I help? Code contributions are welcome. Hardware donations are welcome. If you can help write AfterStep, or feel you can help the effort elsewhere, do so. Hang out on irc (#afterstep, efnet), participate on the mailing lists, suggest ideas, help code, etc etc. 1.11. Who writes this FAQ? 3.1. Where can I get AfterStep 2.0? 3.2. What do I need to compile and install AfterStep? Because AfterStep is an X application, you need to have X installed, and the X development libraries (note, in this case "development" means libraries need to compile things with X, not development level code). It's probably a good idea to also have a working C compiler. Note that following image format do not require any external libraries : XPM, PPM, BMP, ICO, XCF, GIF. 3.3. Can I install AfterStep without being root? 3.4. How do I upgrade AfterStep from AfterStep version prior to 2.0.0? Install AfterStep 2.0 and then run it. It will start with default configuration that you may or maynot like. If you wish to try and reuse your old configuration files, then copy them over from your old ˜/GNUstep/Library/AfterStep/ directory and into ˜/.afterstep/. Restart AfterStep to make changes effective. If some of the features do not work quite right - feel free to submit bug report along with your configuration files. It is recommended though that you start with default configuration and try out all of the supplied looks and color schemes. Select whichever is close to what you want and then modify it to your liking. These approach will allow you to take advantage of many new features, available in AfterStep 2.0. 3.4. How do I upgrade AfterStep from AfterStep version higher then 2.0.0? Make sure that all configuration files that you ever changed are in your home directory at ˜/.afterstep/, as installing afterstep will replace everything in global shared location (/usr/local/share/afterstep). Install afterstep and run. You should not have any trouble. 3.5. What's up with all these compile errors? Most likely, you don't have the X devel package (should have come with your operating system, if not, check http://www.x.org/). 3.6. How the hell does one configure AfterStep? Configuration files are usually either in /usr(/local)/share/afterstep for system wide configuration and ~.afterstep for personal settings. Configuration is handled in multiple files: look file (in looks subdirectory) for visual attributes, feel file (in feels subdirectory) for the general behaviour; wharf, winlist, banner, pager, animate for module specific configuration. Just copy any file you want to modify over from /usr(/local)/share/afterstep to ~.afterstep to override system wide defaults retaining subdirectory layout. 2.1. Where can I find AfterStep resources, or help? AfterStep 2.0 comes installed with complete set of documentation in HTML format, usually installed at /usr/local/share/afterstep/doc/html or /usr/share/afterstep/doc/html . Same documentation is available online from : http://www.afterstep.org/visualdoc.php. If you find that documentation incomplete in some areas - please feel free to submit any corrections to any of the AfterStep mailing lists. The official AfterStep web page is at http://www.afterstep.org/. This web site is managed by whoever has write access to AfterStep CVS, and is kindly hosted by the generous people at Web Conquest. The FTP site, ftp://ftp.afterstep.org/, is the best place to get AfterStep. AfterStep installation comes with set of man pages that attempt to cover all aspects of AfterStep configuration. Please read the relevent man page before asking a question. Also note that the Pager man page is 'man Pager' (note the capitalization). 2.2. What are the AfterStep mailing lists, and where are their archives? There are three AfterStep mailing lists. as-users, as-devel and as-bugs. The mailing list archives can be read at http://www.tigr.net/afterstep/mail/.